Researchers are finding that life can thrive in some unexpected places. "This porridge is too hot," Goldilocks exclaimed. So she tasted the porridge from the second bowl. "This porridge is too cold." So she tasted the last bowl of porridge. "Ahhh, this porridge is just right!" she said happily. October 2, 2003: Scientists hunting for alien life can relate to Goldilocks. For many years they looked around the solar system. Mercury and Venus were too hot. Mars and the outer planets were too cold. Only Earth was just right for life, they thought. Our planet has liquid water, a breathable atmosphere, a suitable amount of sunshine. Perfect. 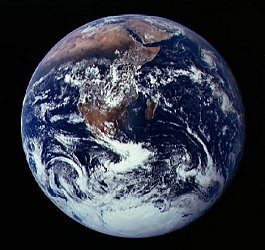 Right: Earth photographed by the crew of Apollo 17. It didn't have to be that way. If Earth were a little closer to the sun it might be like hot choking Venus; a little farther, like cold arid Mars. Somehow, though, we ended up in just the right place with just the right ingredients for life to flourish. Researchers of the 1970s scratched their heads and said we were in "the Goldilocks Zone." The Goldilocks Zone seemed a remarkably small region of space. It didn't even include the whole Earth. All life known in those days was confined to certain limits: no colder than Antarctica (penguins), no hotter than scalding water (desert lizards), no higher than the clouds (eagles), no lower than a few mines (deep mine microbes). In the past 30 years, however, our knowledge of life in extreme environments has exploded. 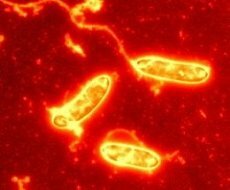 Scientists have found microbes in nuclear reactors, microbes that love acid, microbes that swim in boiling-hot water. Whole ecosystems have been discovered around deep sea vents where sunlight never reaches and the emerging vent-water is hot enough to melt lead. The Goldilocks Zone is bigger than we thought. To find out how big, researchers are going deeper, climbing higher, and looking in the nooks and crannies of our own planet. Searching for life in the Universe is one of NASA's most important research activities. Finding extreme life here on Earth tells us what kind of conditions might suit life "out there." NASA scientists Richard Hoover and Elena Pikuta are among the hunters. This month they've announced a new species of extreme-loving microorganism, Tindallia californiensis, found in California's Mono Lake. 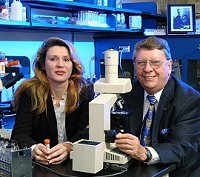 Left: Elena Pikuta and Richard Hoover in their laboratory at the National Space Science and Technology Center (NSSTC). Mono Lake is an extremely salty and alkaline body of water. It is almost 3 times saltier than sea water and has a pH of 10, about the same as WindexTM, a household glass cleaner. (For comparison, a pH of 7 is neutral; 14 corresponds to pure lye.) Surprisingly, though, Mono Lake supports a wide array of life from microbes, to plankton, to small shrimp. T. californiensis is right at home there. It thrives in highly alkaline conditions (pH 8-10.5) and at salt concentrations near 20%. Earlier this year Hoover and Pikuta announced another strange microbe: Spirochaeta americana. They found it living with T. californiensis and perhaps hundreds of other microbial species in Mono Lake mud samples. Finding new species in this abundant collection of microbial life is a detective story worthy of Perry Mason or Hercule Poirot. "Collecting samples from the muddy bottom of this lake and keeping them alive can be tricky business," says Hoover. "These species are killed by the presence of oxygen, so great care must be taken to protect them." Below: A false-color electron micrograph image of Tindallia californiensis. Credit: R. Hoover, NASA. "The battery of tests required to identify a particular species in a sample is extensive," says Pikuta. "For an organism to be identified and then recognized as a new species, it must be completely understood. This includes identifying its growth requirements and metabolism, colonial habit, cellular characteristics, DNA and genome properties, and sensitivity to antibiotics for detailed comparison with other known life forms." Before a life form can be considered a valid new genus or species, it must be deposited in two separate International Collections of Microorganisms and a scientific paper describing all new features of the organism must be either published in the International Journal of Systematic and Evolutionary Microbiology or, if published in another journal, it must be verified by the International Committee on Systematics of Prokaryotes (ICSP), the clearinghouse for bacterial species. Once a microbe is finally accepted as a valid new species, says Hoover, the years of intense labwork and wallowing in smelly lake mud suddenly become worthwhile. The Goldilocks Zone gets a little bigger. And life "out there" seems more likely than ever. Life As We Didn't Know It -- (Science@NASA) Biologists always thought life required the Sun's energy, until they found an ecosystem that thrives in complete darkness. Pictures of Mono Lake: 3D images by Science@NASA editor Tony Phillips; an overhead view recorded by astronauts during space shuttle mission STS-47; a recent picture from space taken by astronaut Don Pettit while he was onboard the International Space Station. 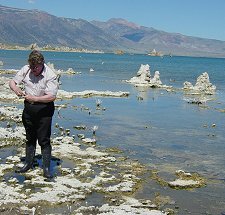 Right: Richard Hoover collects samples from Mono Lake. Amino munchers: "T. californiensis occupies an interesting niche in the food chain of Mono Lake," notes Hoover. "It absolutely requires sodium and its metabolism is usually based on the ingestion of peptone (from digestion proteins). However, T. californiensis can also live entirely on pairs of amino acid pairs. It does not live on sugars and other carbohydrates (as higher life-forms do), and it cannot live on inorganic chemicals." Amino acids have been found in meteorites and many scientists believe that they will be found in other locations of space. Since they are non-living hydrocarbons, and since they are the primary constituents of proteins (the building blocks of living cells), an organism that lives on amino acids, such as T. californiensis could be an early bacterial step on the path to more complex life. Meet Conan the Bacterium -- (Science@NASA) Humble microbe could become "The Accidental (Space) Tourist"
A Mid-summer's Microbe Hunt -- (Science@NASA) A team of explorers including astrobiologist Richard Hoover and astronauts Jim Lovell and Owen Garriott traveled to Antarctica in January 2000 to search for extreme-loving microbes.